Based on a USD price of $5,246.00 and today's exchange rate. Intellian's best-selling system, the i6 is renowned for its robustness and exceptionally strong signal gain. Great for extended offshore voyaging, the i6 is ideal for ocean cruisers, larger yachts and commercial vessels. The Intellian i6/i6P provides excellent commercial-grade performance and efficiency compared to antenna systems in similar size. The i6/i6P is ideally designed for boats over 70 feet. Traditionally, bigger marine satellite antennas had cumbrous weight and complicated cable installation problems. Thanks to the i6's single cable design and the vacuum-forming technology, the i6/i6P has once again proved bigger can be lighter and simpler. With Intellian MIM, boaters can enjoy flipping channels through automatic satellite switching just like a home system. See the installation guide of DISH Network MIM for further details. With its patent-pending innovations in Wide Range Search (WRS) and Dynamic Beam Tilting (DBT) technologies, the i6/i6P can always offer the most precision tracking capabilities and superior quality of satellite signal receptions in the extremely rough sea conditions. The most innovative design of the i6/i6P is the integrated HD and TriSat modules in its control unit. This allows boaters the ability to access their favorite HDTV channels from leading satellite TV service providers easy just like they are used to do at home. The i6/i6P has a built-in GPS system which enhances the speed of satellite signals acquisitions. In addition, the i6P provides the embedded Auto Skew Angle Control system to maintain optimal signal strength and increase the quality of satellite receptions in weak satellite signal coverage areas. 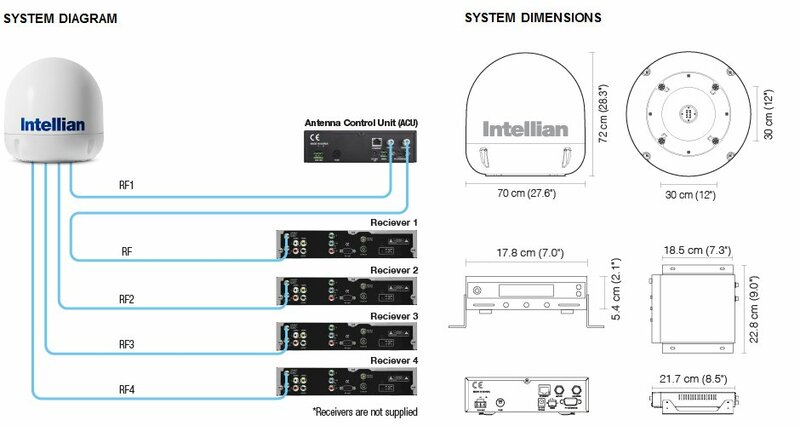 With a single cable to connect the antenna and the ACU, Intellian i6 systems are quick and easy to install. Our advanced ACU is designed to require minimum setup so you can begin to enjoy TV programs aboard your boat in no time. Intellian’s i6/i6P provides HD channels from the Ku-band. The HD module is actually built-in to the Antenna Control Unit of the Intellian i6/i6P for seamless integration and easy installation. Intellian i6/i6P includes a built-in GPS for easier operation and faster signal acquisition. It allows the i6/i6P to have higher accuracy and easy operation wherever the vessel sails. 60cm reflector diameter with nationwide coverage for North & South America, Europe and the regional service around the globe.